One of the principles of conservation agriculture is that of targeted applications of fertilizer as opposed to broadcast applications over an entire field. In a row-crop setting, this can be done by banding fertilizer next to the crops. In systems involving small planting basins, such as the zai pit or Foundations for Farming systems, fertility inputs can be applied to the micro pits into which seeds are sown. One of the studies being carried out by ECHO in South Africa is a zai pit system. We wanted to get better documentation of the effect of concentrated versus dispersed application of cow manure. To do this, we added a few flat ground control treatments including 1) flat ground with broadcast manure and 2) flat ground with the manure concentrated near the sorghum plants. Cow manure was applied about three weeks prior to sowing sorghum seeds, with each plot receiving the equivalent of 400 g of manure per planting station. In the flat ground plots, the manure was lightly raked into the soil. In the zai pits, the manure was mixed with about 5 cm of soil at the bottom of the hole. Soil was sampled the same week as planting. A soil probe was used to collect soil near the sorghum at a depth of 0-10 cm. Each treatment was replicated four times in a randomized complete block design. 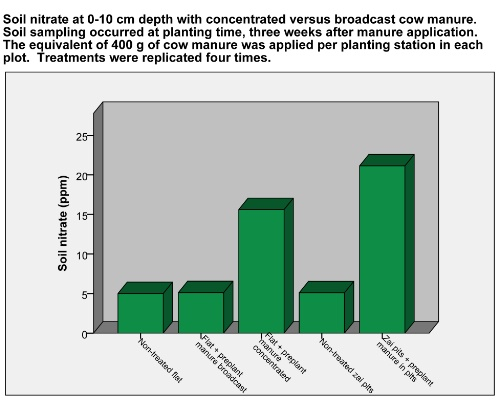 What we found was that, within the flat ground treatments, the soil concentration of nearly every nutrient was statistically higher with concentrated than broadcast manure. Below is a diagram illustrating this with soil nitrate, but the trend held true for P, K, Ca, Mg, S, Fe, Mn, and Zn. Amounts were even higher with the manure placed in zai pits (30 cm wide X 20 cm deep); however, it must be noted that the zai pits received manure during the first growing season as well as the beginning of the second season, whereas this data is taken after only one application of manure in the flat ground plots. Interestingly, soil pH also climbed from 5.7 in non-treated flat ground to 7.2 in the manured zai pits. The take home message is that, to get the most out of your fertilizer, try concentrating it near crop plants. By targeting your fertility inputs near crop plants, it is also possible to reduce your rates, which is the idea behind microdosing. In fact, if you apply too much manure or inorganic fertilizer next to plants, you can end up with salt burn.